Contents note: Processional - Begin with light - These are the spaces - In the beginning - It is good - Blessed is the man - After the beginning - Our chapel - Chapel windows - Let us each - These are the spaces - Elegy - Dawn - Good morning - Run in the morning - The giant stride - In the morning - Jacarandas - Processional. Dedication note: "To the girls of Pymble Ladies' College". Score: A special inheritance : a cantata commemorating the 75th anniversary of the foundation of the college / music by Colin Brumby ; words by Thomas Shapcott. Parts: A special inheritance : a cantata commemorating the 75th anniversary of the foundation of the college / music by Colin Brumby ; words by Thomas Shapcott. CD: Shall we dream? 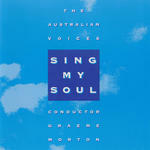 / the Sydney Children's Choir ; directed by Lyn Williams. 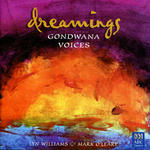 CD: Dreamings / Gondwana Voices ; Lyn Williams & Mark O'Leary, conductors.